I couldn’t believe my eyes when I saw Kyle Duncan testifying before the Judiciary Committee on C-Span this morning on November 29, 2017. This cannot and must not stand. 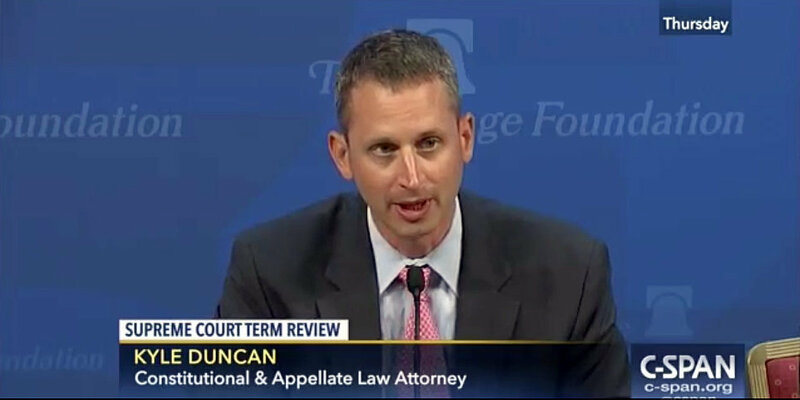 Kyle Duncan is one of President Trump’s nominees for the 5th Circuit Court of Appeals, who gave his qualifications today before the Senate Judiciary Committee for consideration. He is one of those outsiders who came to my hometown of Murfreesboro, TN and joined the Obama administration’s Dept of Justice in forcing our community to allow the construction of a 52,000 square foot mosque for 120 Muslim families, giving the evil and violent ideology of Islam a firm foothold in Rutherford County. He was bragging about his role in this controversy that unfolded between 2010 and 2011, and he was bragging about having Obama for an ally, which basically paved the way for the Catholic Charities and the Obama Administration to make Murfreesboro, TN and Shelbyville, TN dumping grounds for thousands of Muslims, who do not integrate, do not try to assimilate and espouse ideas and beliefs that are antithetical and diametrically opposed to Our Constitution. This man must not be seated on the Court. It would be a disaster for freedom in America, and it would not be long before Americans would see this FOOL allowing some aspects of Sharia Law into U.S. Law, which would open the door for a more intense Islamic advocacy towards the entirety of Sharia Law in that particular area. The only reason I can see Duncan getting any traction is that he has a long record of legal advocacy against gay marriage , transgender bathroom laws and abortion “rights”. I imagine President Trump sees him as a great pick, if He decides to try to overturn Roe V Wade. In this sense, Trump would be right. But for me, I know there are other legal minds, better than Duncan, who also have a strong legal track against abortion and who also are not Muslim appeasers and sympathizers of Islam in America. This one issue on Islam alone disqualifies him, as far as I’m concerned. Duncan is the sort of political hack, who would have no problem acquiescing to Muslim demands to criminalize any criticism of Islam and side with proponents of “hate-speech”, as it now exists across the European Union. He has the mindset that would also side with open borders for Muslims, aiding in the current invasion by people, Muslims, who have brought Our country nothing but more civil unrest and violence. Flood the White House and the U.S. Senate with calls now and demand that Kyle Duncan be removed from ANY consideration to any position in this administration.